Hollywood is atwitter at the very thought that Oprah Winfrey might be willing to carry the progressive banner into the 2020 presidential race. Her speech on Sunday at the Golden Globe affair was taken by many as an indication that she might be convinced to throw herself and her considerable fortune into the crusade to rid the nation of Donald Trump. The only person seemingly more excited than actress Meryl Streep at the prospect is The Weekly Standard’s Bill Kristol. 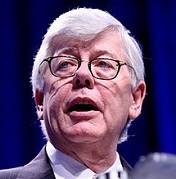 For more about guns in America and David Keene Watch this.